O God, who through your Son raised up your eternal light for all nations, grant that your people may come to acknowledge the full splendor of their Redeemer, that, bathed ever more in his radiance, they may reach everlasting glory. Through our Lord Jesus Christ, your Son, who lives and reigns with you in the unity of the Holy Spirit, one God, for ever and ever. Historically today is the feast of St. William of Bourges, Cistercian bishop who distinguished himself by his austerities, concern for the poor, the defense of the rights of the Church against the French crown, and his success in converting many members of the Albigensian heresy. Every country in the world has its own Christmas customs. Christmas in Australia is often very hot. Whereas the northern hemisphere is in the middle of winter, Australians are baking in summer heat. It is not unusual to have Christmas Day well into the mid 30 degrees Celsius, or near 100 degrees Fahrenheit. William Berruyer, of the illustrious family of the ancient Counts of Nevers, was educated by Peter the Hermit, Archdeacon of Soissons, his uncle by the mother's side. From his infancy William learned to despise the folly and emptiness of the world, to abhor its pleasures, and to tremble at its dangers. His only delight was in exercises of piety and in his studies, in which he employed his whole time with indefatigable application. He was made canon, first of Soissons, and afterwards of Paris; but he soon resolved to abandon the world, and retired into the solitude of Grandmont, where he lived with great regularity in that austere Order until finally he joined the Cistercians, then in wonderful odor of sanctity. After some time he was chosen prior of the Abbey of Pontigny, and afterwards became Abbot of Chaalis. On the death of Henri de Sully, Archbishop of Bourges, William was chosen to succeed him. The announcement of this new dignity which had fallen on him overwhelmed him with grief, and he would not have accepted the office had not the Pope and his general, the Abbot of Citeaux, commanded him to do so. His first care in his new position was to conform his life to the most perfect rules of sanctity. He redoubled all his austerities, saying it was incumbent on him now to do penance for others as well as for himself. He always wore a hair-shirt under his religious habit, and never added to his clothing in winter or diminished it in summer; he never ate any flesh-meat, though he had it at his table for strangers. When he drew near his end, he was, at his request, laid on ashes in his hair-cloth, and in this posture expired on the l0th of January, 1209. 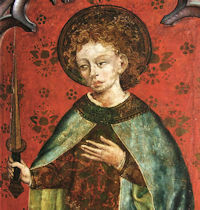 His body was interred in his cathedral, and being honored by many miracles, was taken up in 1217, and in the year following, William was canonized by Pope Honorius III. 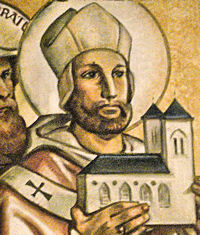 Learn more about St. William of Bourges here and learn more about St. William of Bourges here.